Other Places Nearby: The oldest street in America with its original houses; an arts and education center; a canal museum. Meetings & Event Options: The State University of New York at New Paltz offers some on-campus meetings facilities, and the historic Mohonk Mountain House has 14 meeting rooms. The Grand Hotel and the adjoining Mid-Hudson Civic Center in Poughkeepsie and resorts near Minnewaska State Park in Kerhonkson and Ellenville are other options. Looking to take a break from his farm work and head out on a traditional family outing, 19th-Century Quaker farmer Alfred Smiley flipped a coin into the air — or so the story goes. Heads and the Poughkeepsie, New York-based family would travel to West Point; tails and everyone was off to Paltz Point. The coin came up tails — a fortuitous toss that, unbeknownst to the Smileys, would lead to ownership of some of the nation’s most spectacular mountain lands and a regional hotel and resort empire. On this walking tour (see Getting Here and A Recommended Walk), you’ll quickly understand why the Smileys decided to sell their farm once the family set eyes on the Shawangunk (pronounced SHON-gum) Mountains west of Paltz Point, near the present-day college town of New Paltz. The “Gunks,” as they’re affectionately known by rock climbers and other outdoor enthusiasts, tower more that 2,000 feet above the Hudson Valley and feature unique perpendicular rock formations composed of quartz pebbles and sand. The 41-year-old Smiley convinced his twin brother Albert to join him in buying 300 acres of Gunks land, a tavern, and a lake for $28,000 in 1870. Though the twin brothers knew nothing about the lodging profession, they converted the tavern, situated atop Mohonk Mountain, into a hotel called the Mohonk Mountain House. The hotel, which is still in operation today, sat picturesquely next to small Mohonk Lake, and the setting attracted vacationers. The hotel’s popularity rapidly grew, and the facility seemed to forever be expanding. In 1876, Alfred and Albert took their families on a picnic to Peterskill Falls, located a few miles southwest of the Mountain House. Their horse-and-buggy driver mentioned that the mountain rising above the falls was home to beautiful Coxing Pond. The Smiley brothers let the driver take them there and were smitten by the sight. Surrounded by magnificent rock cliffs, Coxing Pond was bigger than Mohonk Lake, and its pristine, azure waters sparkled. Alfred quickly found the property owner and negotiated a deal: 2,500 acres of land and the pond for about $3,000. Though Alfred liked the price, he didn’t like the name of the pond and changed it to a Native American-sounding name, Minnewaska, the lake you circle in this walking tour. The name is fictitious and was not a part of any Native American tongue. After acquiring the land, Smiley arrived from Mohonk daily by carriage to oversee construction of a road to the lake and another resort, the Minnewaska Mountain House. The new resort opened in June 1879, and Smiley moved his residence there from Mohonk. On horses and carriages, guests shuttled back and forth between the Minnewaska Mountain House and the Mohonk Mountain House. Guests were allowed to eat their meals, which were included in the room rate, at either property. Liquor, dancing, and card-playing were forbidden, according to Quaker custom. Guests instead were encouraged to take nature walks, go boating and fishing, and enjoy the outdoors. A 10-minute prayer service was held daily after breakfast. In 1887, Smiley opened another hotel, the Wildmere, on the shores of Lake Minnewaska and gave the Minnewaska Mountain House a new name, the Cliff House. The two hotels offered more than 350 rooms for vacationers and became known as the Minnewaska Mountain Houses. A series of acquisitions increased Smiley’s Minnewaska land holdings to 10,000 acres by the time of his death in 1903. Included in those 10,000 acres was Lake Awosting, the largest glacial lake in the Shawangunk Mountains. Smiley’s sons, and then a grandson, ran the popular Mountain Houses for the next 50 years. The health of the grandson, Alfred Fletcher Smiley, began to deteriorate, and business dropped off. Guests were staying fewer days, and the resort was saddled with increased costs. Finally, in 1955, Smiley sold the resort to his right-hand man, Ken Phillips, and his wife, Lucille. In an attempt to generate more revenue in the mid-1960s, the Phillipses ended the long-standing liquor taboo, building a bar in the basement of the Cliff House. They also permitted, for the first time, motor boats on Lake Minnewaska and developed a golf course. The Phillipses decided to turn the resort into a year-round destination, building ski slopes and a ski lodge. But the ad campaign to “Ski Minne” never paid off, and the Phillipses were $1.3 million in debt. The banks that had lent money to them scheduled an auction to sell off their property. Just hours before the auction, the Phillipses agreed to sell Lake Awosting and about 7,000 acres to the Palisades Interstate Park Commission for $1.5 million. The bi-state (New York/New Jersey) agency had sought all the family’s landholdings, but the couple insisted on keeping two hotels, the ski lodge, and the land immediately surrounding Lake Minnewaska. The money received from the park commission wasn’t enough to revitalize the two hotels, and the Phillips family couldn’t get financing for their plan to turn the Minnewaska Mountain House into time-share condominiums. The parks commission bought another part of the land, and New York State obtained a conservation easement prohibiting major construction on 239 acres of land around Lake Minnewaska. In 1978, after standing for 99 years, the Cliff House was destroyed in a fire of unknown origin. The house was uninsured, bringing no financial relief to the Phillipses. Two years later, the Marriott Corporation fell in love with the Minnewaska property. The giant hotel company acquired an option to purchase nearly 600 acres, including Lake Minnewaska and surrounding lands that were protected by the state easement. Marriott planned to construct a huge resort complex, including a 400-room hotel, 300 condominiums, a golf course, and an ice-skating rink. The company’s plans triggered one of the biggest wars between developers and environmentalists in the nation’s history. 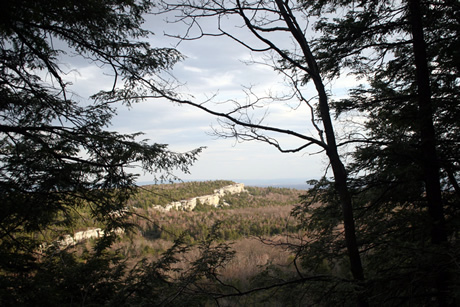 Local residents formed an opposition group called Citizens to Save Minnewaska, and they were joined by other environmental groups. The coalition pointed out that Marriott’s proposed golf course would violate the state’s land easement, and they argued that there wasn’t enough available water at Minnewaska for the planned hotel and condos. Despite the arguments, the park commission decided to amend the conservation easement, allowing Marriott to build its golf course, drill wells within the easement area, and increase the use of water from Lake Minnewaska. The environmentalists refused to be defeated, soliciting donations and holding fund-raising rallies and benefit concerts. Musicians living near Minnewaska even produced a record album, and proceeds went to the anti-development cause. Under the name Friends of the Shawangunks, Inc., the environmentalists filed suit to stop the planned development. After a heated six-year battle, a federal appeals court ruled that the proposed golf course violated the terms of the easement. Marriott abandoned its development plans. In 1987, the state finally bought the rest of the land from the Phillips family. Today, as you walk on the carriageways that were used to transport 19th-Century vacationers to the resort hotels, you’re the real winner in the long development battle. The land remains very much the way it was when the Smileys first bought it in the 19th Century, and you’re left in awe at the wonder of Lake Minnewaska and the surrounding Shawangunk Mountains.